One step closer to becoming a data-driven organization. Dedicated to take data-driven applications into production. Taking models into production requires a professional workflow, high quality standards, and scalable code and infrastructure. This magazine is dedicated to reaping benefit from data by taking data-driven applications into production. Many organisations develop successful proof of concepts but then don’t manage to materialize the models beyond their laptops. Taking models into production requires a professional workflow, high quality standards, and scalable code and infrastructure. 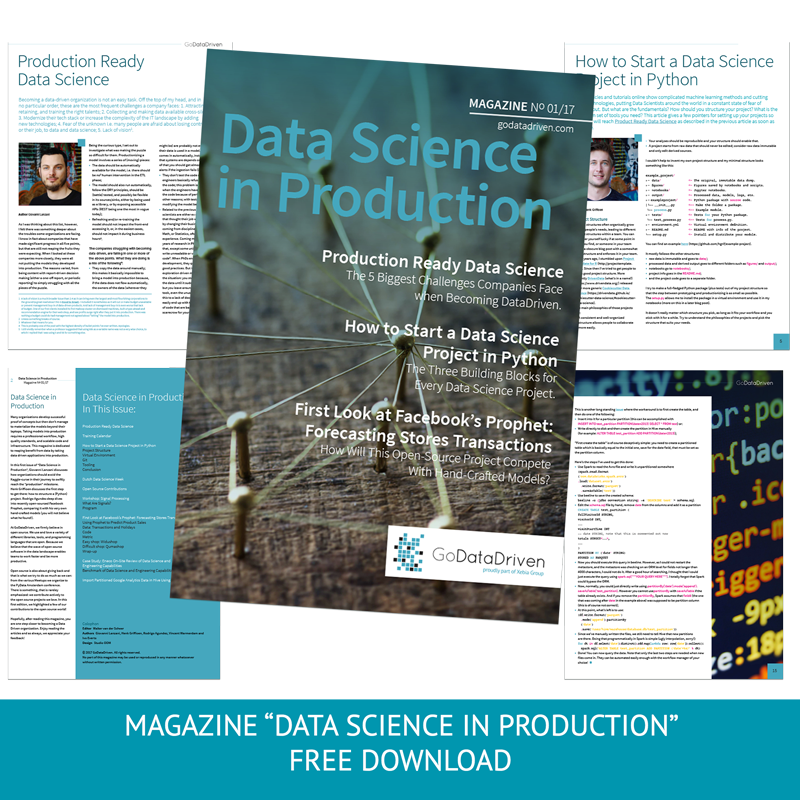 Data Science in Production is dedicated to reaping benefit from data by taking data-driven applications into production. Open source is also about giving back and that is what we try to do as much as we can: from the various Meetups we organize to the PyData Amsterdam conference and Dutch Data Science Week. There is something, that is rarely emphasized: we contribute actively to the open source projects we love. In this first edition, we highlighted a few of our contributions to the open source world! Hopefully, after reading this magazine, you are one step closer to becoming a data-driven organization. Enjoy reading the articles and as always, we appreciate your feedback!